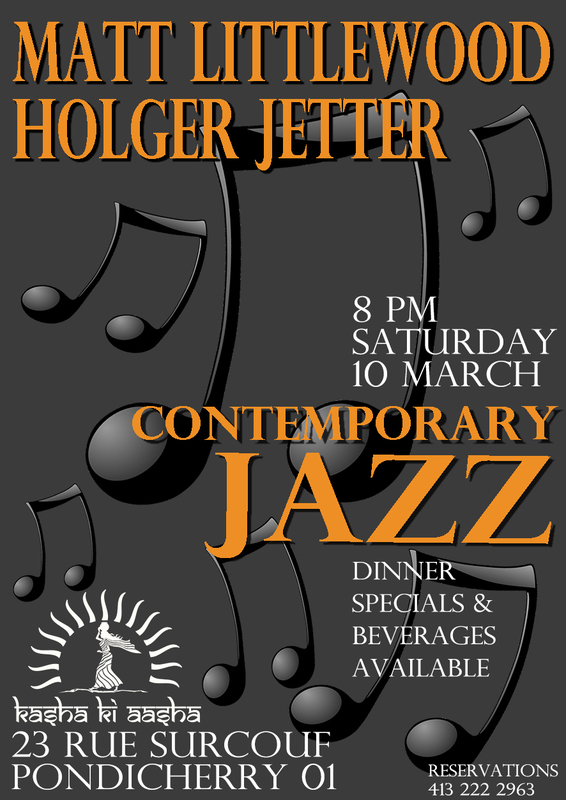 This Saturday evening, Holger Jetter and Matt Littlewood bring Contemporary Jazz to Kasha Ki Aasha’s terrace. This string/keyboard duo presents a level of musical sophistication that is a rare find and according to one of our guests not even available in metros like Bangalore. So if you are looking for a truly unique Pondicherry experience, call to reserve your table for 8 pm this Saturday evening. (Tel: 413 222 2963). Kasha Ki Aasha is just a hop, skip and a jump over the canal at 23 rue Surcouf, Pondy 01. Come join us for an evening of truly GREAT music, great food and great people. First set begins at 8 pm.